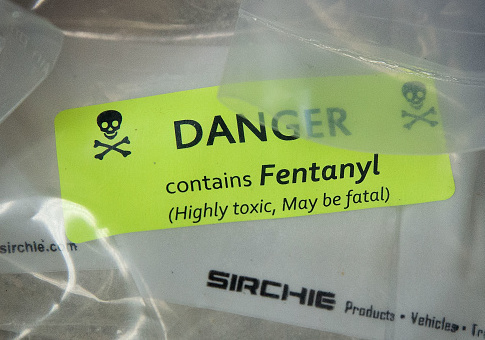 A Chinese national and Massachusetts resident pleaded guilty on Tuesday to trafficking in kilogram quantities of the deadly opioid fentanyl. Bin Wang, 43, admitted to ten offenses, including drug conspiracy, conspiracy to import a controlled substance, and drug distribution. Wang had operated a number of shell companies out of a warehouse in Woburn, Massachusetts, from which he distributed synthetic opioids to buyers in Ohio. Chinese producers are responsible for the production of much of the fentanyl which floods into the United States. In April, the Department of Justice charged four Chinese nationals with having produced large quantities of fentanyl in factories across southeast Asia and imported it into the United States, often through the U.S. mail. "The importation of opioids and other synthetic drugs from China has played a significant role in America's current drug use epidemic," said DEA Special Agent in Charge Timothy J. Plancon. "Over 60,000 people a year die from drug overdoses in this country, and halting all methods of drug trafficking, including by way of the Internet is a top priority of the DEA." Wang similarly distributed his wares using private mail carriers like FedEx. From his Massachusetts home base, he distributed fentanyl and derivatives like acetylfentanyl or the elephant tranquilizer carfentanil. "Wang was responsible for receiving shipments of deadly opioids and other drugs from China and then sending them to Ohio and throughout the United States," U.S. Attorney Justin Herdman explained. Wang received his drugs in turn from a Chinese source whom DOJ identified as "Gordon Jin." Buyers would wire money to Jin, who would then send drugs to Wang for distribution. This scheme went on from November of 2016 to July of 2017, according to court filings. "This investigation is a great example of a collaborative effort of federal agencies and a local drug task force working together to identify and track down people and organizations that are responsible for the ever-increasing shipments of very powerful synthetic opiates into Ohio," said Don Hall, director of the MEDWAY Drug Enforcement Agency. Wang is scheduled to be sentenced on Nov. 13.